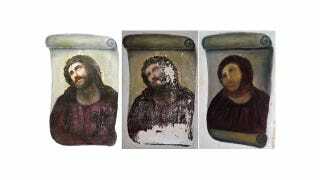 In case you missed it: the lady who famously, hilariously ruined that priceless Spanish Jesus fresco by making God's son look like an opossum in the throes of distemper would now like to be paid for her work. Really. 80-year-old Cecilia Giménez has apparently lawyered up after the church that owns the fresco received an uptick in donations flocking to gawk at "Beast-Jesus." The church has also obtained legal representation. At the center of the dispute is about $2,600 in church donations. Apparently since Giménez is the one who ruined the art, she believes she should be entitled to proceeds from the ruined art.